Zatanna has been on my to-do list ever since I started making customs. Somehow, she always got bumped, and never made it to the top of the list. Even after saving Charlie Jackam’s great recipe, I always seemed to have other characters demanding my attention first. 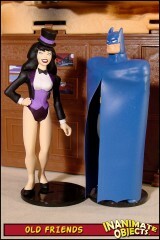 Alas, Zatanna’s day has come! Since Charlie’s great custom, new fodder has become available. Again, I turn to the Hasbro-TRU exclusive Ivy figure as a base, because it’s very appropriate for old school female designs. I Dremeled away the extraneous details. The vest, jacket, sleeves and shoulders are comprised of Kneadatite. The cuffs, lapels, tie and tails are cut from vinyl. I chose a Hasbro Supergirl head, as the face was the right shape, she’s smiling appropriately, and the bangs are reasonably close. (Okay, the bangs should go right, not left. I cut a corner.) The new hair is one big blob of Kneadatite. Penguin donated his top hat for the cause. I was uncertain about this piece, even after priming and spraying white. It wasn’t until I had her fully painted that she came together for me, and I feel she did so nicely. I’m very pleased with the final product.